Super Shad Rap Lure. Year after year, the Super Shad Rap delivers, with trophy fish taken worldwide from the clear Nordic lakes to the murky waters of the Amazon and jade green ocean waters of the tropics. The patterns and colors offer perfect imitation of a favorite prey of fish. Whether talking to big pike maniacs or big water trollers, they all have one thing in common: the great fish-catching power of the Super Shad Rap. A very high buoyancy body with good profile and sturdy construction produces a rolling action with floppy wobble. To fish the Super Shad Rap over very shallow areas or vegetation, keep the rod tip up and retrieve slowly. The lure will roll and wobble bulging the surface, creating a good wake behind it. On a faster retrieve the Super Shad Rap will dive to about 1.5 meters. It can be fished with a fairly steady retrieve, but also with sweeping the rod of even with hard jerks. Slow side sweeps with the rod will create a sliding action with natural stops when the rod is brought back to forward position. Reel in slowly while bringing the rod back to pointing towards the lure to keep away any slack in the line. This will help feel even the wariest bites and also slows the lures rise. For an aggressive approach use a jerk bait retrieve. 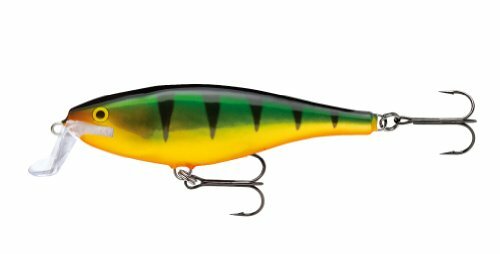 Pumping the rod up will keep the Super Shad Rap close to the surface and jerkin the tip down will let the lure work deeper. The jerking retrieve can help bring out fish from heavy cover, so try it close to heavy cover and thick weed beds.